OWC Mercury Elite Pro RAID "Quad"
are standard for the OWC Mercury Elite Pro RAID Series! High Performance: The High-Speed Oxford 936 eSATA / FireWire 800/400 & USB 2.0 chipset combined with the fastest SATA drive mechanisms available give Mercury Elite Pro RAID Solutions some of the fastest single drive transfer rates possible, even exceeding 120 Megabytes Per Second! High Reliability: A Top-Notch Design and the Best Components ensure the Mercury Elite Pro Series is Built to Last. 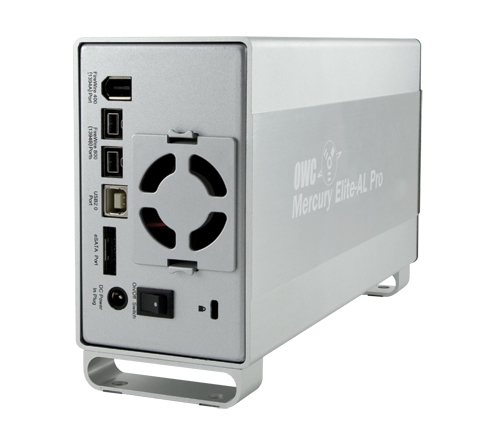 The OWC Mercury Elite Pro offers balanced power and performance for desktop computing Utilizing a Hitachi Deskstar E7K1000 hard drive provides an exceptional blend of power efficiency and performance making it an ideal solution for power-conscious enterprises. Leveraging seventh- generation power management technology, as well as power-saving innovations pioneered on the popular 2.5-inch line of notebook hard drives from Hitachi, this new breed of drive delivers best-in-class power management and thermal emissions to help manufacturers meet energy compliance targets and extend drive life.! Enterprise Class: The Deskstar E7K1000 delivers value to the enterprise 7200 RPM performance and innovative technologies like Rotational Vibration Safeguard (RVS). To mitigate any adverse impact on system performance, Hitachi-patented RVS technology works to counteract this disturbance ensuring drive performance and data integrity. The drive also has a targeted 1.2 million hours MTBF rating and provides the industry’s most comprehensive 5-year warranty. High Portability: The Compact and Shock Resistant Design has the Mercury Elite Series going places! In addition, the OWC Mercury Elite Pro RAID series offers (1) eSATA port, (2) FireWire 800(1394B) ports, (1) FireWire 400 (1394A) port and 1 USB 2.0 port for Easy Plug and Play on ANY system! The OWC Mercury Elite Pro RAID even includes all types of cables! 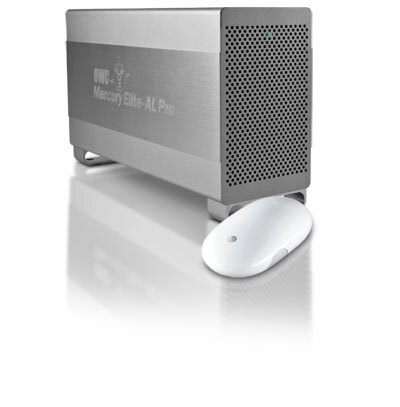 Style: Designed to compliment any user's system, the OWC Mercury Elite Pro RAID was created in mind with the Power Macintosh G5 system as a starting point. As the pictures show, it's a fine storage solution for any computer. Also, a blue activity LED compliments the design recessed behind the front grille showing when your drive is being accessed. Time Machine ready means that our external hard drives keep an up-to-date copy of all of your files and document under OS X Leopard™. Go back in time to recover anything with ease. Backup Made Easy. Data Backup makes it easy to backup to FireWire and USB drives, network drives, CDs and even DVDs. Make schedules so you don'tneed to 'think' about backing up... It does it for you. A $59.00 Value! NovaBACKUP has been helping millions of users recover from data loss and disasters for over 18 years. 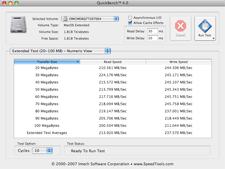 Feature rich, NovaBACKUP provides a powerful backup solution. Built-in support for hundreds of the most popular storage devices and a step-by-step backup and restore wizard makes NovaBACKUP extremely easy to use. Requires Windows 2000 and later. A $49.95 Value! 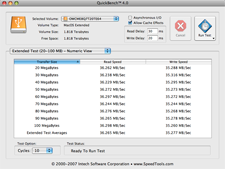 Intech Hard Disk SpeedTools consists of a suite of utilities managed by an application which administers the launching, documentation and version control of each individual component utility, such as Disk Defrag and QuickBack. An easy-to-use installation and removal application is provided to make installation a snap, Intech SpeedTools is powerful enough to allow you to customize which utility component set you would like to create. Mac OS X 10.0.x and later - including the latest 10.5.x Leopard™,	Mac OS 8.6 and Later. 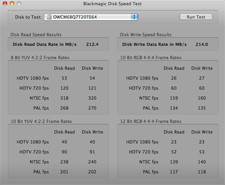 Mac OS X 10.2.8 or later required for FW800 or eSATA Operation. Windows 2000 or later required for FW800 or eSATA Operation. Non-RAID Span mode combines any two drives to give a single volume of combined total drive capacity. RAID 1 also supported, but we strongly recommend the NewerTech Guardian MAXimus for maximum RAID 1 performance requirements. Mac OS 8.6 to 9.2.2, 10.0.x or later and an available USB 1.1 or FireWire 400 port. 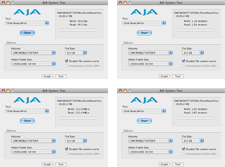 Mac OS X 10.2.8 or later and an available USB 2.0/1.1, FireWire 800/400 port, or eSATA port. Windows 98SE or later and an available FireWire 400 or USB 2.0/1.1 port. Windows 2000 or later and an available USB 2.0/1.1, FireWire 800/400, or eSATA port. For more information about the OWC 3 Year Solution warranty, click here. *OWC reserves the right to replace or upgrade to equivalent or better components. in the Macintosh Products Guide.